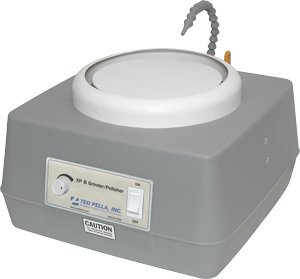 This compact 8" Grinder, Lapper, Polisher is well suited for manual finishing of embedded specimens using PSA backed grinding, lapping and polishing (cloths) discs. The housing is made from non-corroding sturdy plastic. The durable 1/4 HP motor has a variable speed control for 80-2000 rpm to select the optimum speed for grinding or polishing. The XP 8 includes a flexible and variable water spout for grinding applications. Ideally suited for smaller labs and priced so that you can afford multiple dedicated XP 8 grinding and polishing systems. The 8" discs of the XP 8 Grinder - Lapper - Polisher are of the screwback type (leaving a flat surface on top) and can be easily exchanged for discs with other grinding / lapping / polishing discs.